The U-2 provides high-altitude surveillance of an area in direct support of the United States and allied ground and air forces. It provides critical intelligence to decision makers through all phases of conflict, including peacetime indications and warnings, crises, low-intensity conflict and large-scale hostilities. The U-2 is a single-seat, single-engine, high-altitude, reconnaissance aircraft. The U-2's wing gives it glider-like characteristics. Like the SR-71, it can carry a variety of sensors and cameras and is an extremely reliable reconnaissance aircraft. Because of its high altitude mission, the pilot must wear a full pressure suit. The U-2 is capable of collecting multi-sensor photo, electro-optic, infrared and radar imagery, as well as performing other types of reconnaissance functions. However, the aircraft can be a difficult aircraft to fly due to its unusual landing characteristics. The first U-2 made its first flight in August 1955. The U-2R, first flown in 1967, is much larger and more capable than the original aircraft. A tactical reconnaissance version, the TR-1A, first flew in August 1981 and was delivered to the Air Force the next month. The TR-1 was structurally just like to the U-2R. The last U-2 and TR-1 aircraft were delivered to the Air Force in October 1989. In 1992 all TR-1s and U-2s were redesignated U-2R. Current U-2R models are being reengined and will be designated as a U-2S/ST. 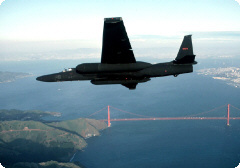 U-2s are based at Beale AFB, CA and support national and tactical requirements from four operational detachments located throughout the world. Crew members are trained at Beale using three U-2ST aircraft. All Information gathered from Air Force Link. Page rendered on 24 April 2019 at 23:52:02 in 454.903 microseconds.